Motorcycles have had mass appeal to the general public for roughly a century and a half. An American named Sylvester Howard Roper designed one of the first motorcycles in the 1860s. The motorcycle was displayed at fairs and circuses around the eastern U.S.. Europeans also had their hand in popularizing motorcycles and, during the World Wars, motorcycles functioned as a quick means of transportation. 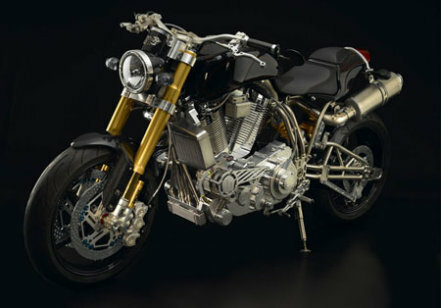 This expensive motorcycle was created by Claudio Castiglioni, MV’s director. He wanted to create a spectacular motorcycle that met strategic marketing needs while also being something truly special and unique. The expensive motorcycle bearing his very own initials “CC” has a top speed of 315 kph (195 mph), 1078 cc’s and a 198 hp engine. Each bike boasts a platinum plate located near the top of the steering column showing the model number from 1 to 100, making this motorcycle all the more special to its owners. Not only is this motorcycle expensive, it’s also extremely fast. This bike, also known as the Y2K Turbine Superbike, is the Guinness World Record holder for the “Most Powerful Motorcycle Ever to Enter Series Production”. The turbine engine in this one is made by Rolls Royce and is capable of over 300hp. The motorcycle also boasts carbon fiber fairings, a rear mounted camera with LCD color display, forward-and rear-looking radar detector with laser scrambler, one touch “Smart Start” ignition, and many other cool gadgets. This bike seams to be pretty popular in Hollywood. It starred in the movie “Torque” and even Jay Leno owns one! This bike was created by Andrew Morris in honor of legendary British Grand Prix motorcycle champion Barry Sheene, who died in 2003 at the age of 52. As such, only 52 of these 250 hp, turbocharged 1400cc motorcycles will be created, each emblazoned with a playing card hand-painted by the same artist who painted Sheene’s helmets, Mike Fairholme. Each of these bikes will be bespoke, tailored to fit the purchaser’s unique requirements. 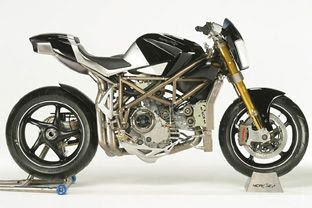 Built around a Ducati 998RS engine, this motorcycle’s Italian designers and engineers set out to create an extremely high tech and expensive motorcycle that would be thought of as “the ultimate track bike” that is “simply beautiful and beautifully simple”. The Testastretta engine is fitted with lightweight metals and alloys, like titanium and aluminum, making it very lightweight. The view from the side of the Macchia Nera shows exposed belts and engine components, giving its design a minimalist feel while still being aesthetically pleasing. We should add that this bike is a one of a kind and not in produced for retail at this point, but if you have an extra 150,000 Euros (US $201,000) laying around for an expensive toy, your dream might come true. 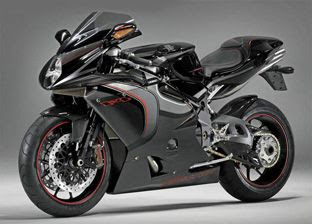 This luxury motorbike features a titanium chassis with clear coated carbon fiber bodywork and wheels. It features a fuel injected, intercooled, supercharged 2,150cc billet motor and is capable of over 200 hp. Its saddle is ergonomic and adjustable. The bike also comes with a timepiece, designed by French watchmakers BRM, which is made to match the bike and is engraved with the same serial number as the handlebar clamp and VIN plate. This bike is limited to only 10 units. This reproduction of Dodge’s concept bike is considered an “automotive sculpture,” as it is not street legal in the US. Ten of these bikes were offered by Neiman Marcus in their 2003 Christmas Book. 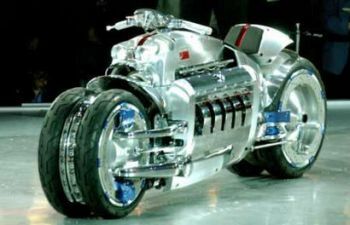 The Dodge Tomahawk V10 superbike boasts an 8.3 liter engine (505 cubic inch), and the 10 cylinders can bring the bike to a maximum speed of almost 400 mph. The 1500lb bike has an independent 4-wheel suspension and can reach 60 mph in around 2.5 seconds.